Outfit details: vintage ruffled polka dot dress, Theyskens’ Theory boots, vintage patent top handle bag, sunglasses via Asos via Samantha via The Matrix. Lately, I’m trying to focus on pushing out of my comfort zone. It’s easy to wear a simple outfit and feel cute, it’s another to pull off something that sticks out in a crowd. The recent online conversation over Jacquemus’ PFW show got me thinking about this. As a refresher: some people have commented that Jacquemus’ recent work pales in comparison to the strong, edgy looks of his previous shows (SS17 changed my life). By all means, do your thing Simon, but consider the gravity that goes with being such a touchstone in the modern fashion world. Sheer mini dresses aren’t really inspiring any greatness here. 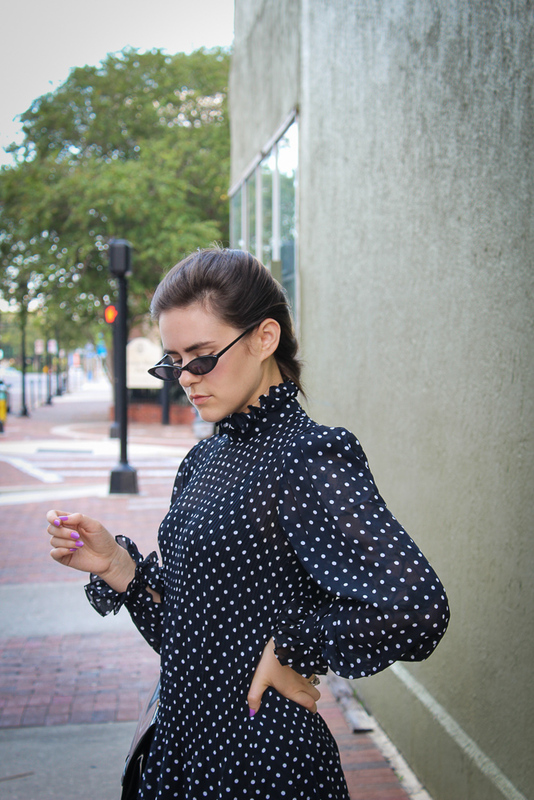 Speaking of sheer dresses, this polka dotted number was another great thrift store score. The voluminous ruffles at the neck and sleeves reminds me of a victorian clown a little big. I’m also smitten with the drop waist shape; I normally gravitate towards clothes that are waist accentuating, so it’s refreshing to wear the opposite.